A Soyuz 2-1A rocket stands tall atop its launch pad at the Baikonur Cosmodrome for liftoff on Monday to deliver the Progress MS spacecraft into orbit for a resupply mission to the International Space Station. This marks the first launch of a Progress spacecraft on the upgraded Soyuz rocket since April’s failure that claimed the loss of the Progress M-27M spacecraft. Progress MS is the first in the next generation of improved Progress spacecraft introducing a number of new systems, largely focused on flight control and communications. 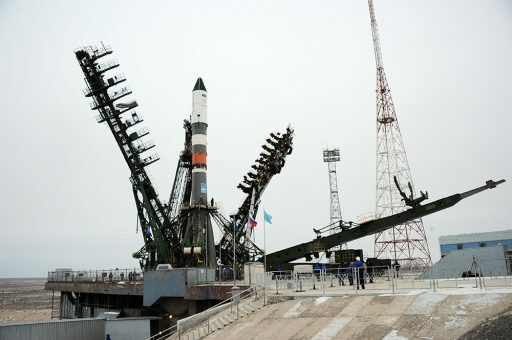 Liftoff from Site 31/6 is planned at 8:44 UTC on Monday and the Soyuz rocket will need a little under nine minutes to send the 7,200-Kilogram spacecraft into orbit. Because this is the first flight of the new Progress version, the spacecraft will take the scenic route and make use of the 34-orbit rendezvous profile instead on the express six-hour link-up to be able to undergo detailed in-orbit testing before being allowed to come close to the Space Station. Docking is planned at 10:31 UTC on Wednesday. Progress MS introduces a number of changes including a new Unified Command and Telemetry System ending Russia’s reliance on the Ukrainian-built Kvant-V radio. The new line of spacecraft are capable of communicating with the Luch satellites in Geostationary Orbit acting as data relay points so that communications are available for the majority of the craft’s orbit. Previously, communications were only possible on orbits taking the spacecraft over Russian ground stations. Implementing GPS and Glonass receivers, Progress will be able to complete on-board orbit determination, no longer relying on radio tracking from the ground. Also, a new Proximity Communications System is introduced to allow ISS and Progress to exchange position data for relative navigation. The KURS-A navigation system will be replaced by KURS-NA that reduces the number of antennas, cuts weight and increases accuracy when Progress navigates around the Space Station to find its docking port. Furthermore, Progress MS hosts additional debris and meteoroid shields, a secondary drive mechanism in the docking system provides added redundancy, and multiple external compartments can be used to release CubeSats from the Progress. Monday’s launch is the first of the Progress vehicle atop the Soyuz 2-1A. Replacing the older and less-capable Soyuz U, the 2-1A version of the launcher hosts a digital flight control system and modified third stage tank structure. 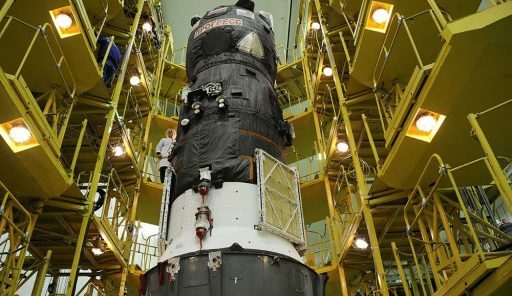 It flew for the first time with the Progress spacecraft on the M-25M mission last year and was successful in placing the spacecraft in an accurate orbit for a fast link-up with the Space Station. The second flight of Progress atop the Soyuz 2-1A came in April when Progress M-27M had a smooth ride into orbit but ran into trouble at separation. Both, the third stage of the Soyuz and the Progress spacecraft, sustained extensive damage at the moment of spacecraft separation. 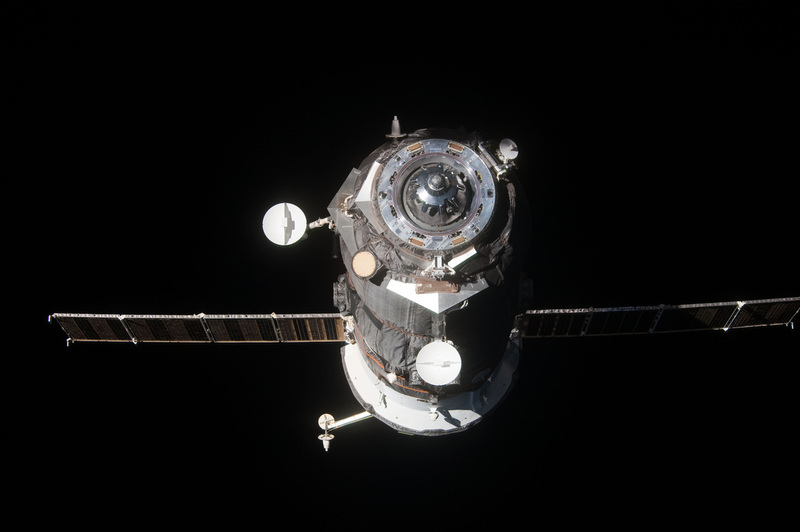 The Progress spacecraft lost pressure in its propulsion system and entered an uncontrolled tumble before running out of battery power, marking the untimely end on what was to be a multi-month ISS resupply mission. Progress M-27M re-entered ten days after launch and a detailed inquiry into the mishap was started. Data collected in the final seconds of the flight of the Soyuz 2-1A was scrutinized and ground-based testing was conducted with the conclusion that unexpected frequency dynamic characteristics had led to an improper separation of the spacecraft. These characteristics arose from the modified third stage structure and spacecraft adapter, requiring modifications of the coupling of the booster stage and the Progress spacecraft to ensure a clean separation on subsequent flights. The launch of Progress MS had slipped from November 21 to provide teams an additional month to complete reviews of changes made to the separation system after the failure. The spacecraft has been at the Baikonur Cosmodrome since August, completing final testing operations before being loaded with cargo for the six-person crew aboard the Space Station. Vacuum testing was finished in October and the spacecraft underwent detailed stand-alone testing to verify the functionality of all electronics. The one-month delay caused a stand down at the Processing Facility where the Progress was kept in a safe configuration before the launch campaign resumed with Propellant Loading in early December. Once fueling was complete, the Progress was moved to the Spacecraft Processing Facility for final cargo loading and a final round of pre-flight testing. The spacecraft was mated to its payload adapter followed by a detailed inspection and the removal of the last protective covers from the vehicle for the encapsulation of the spacecraft in its protective payload fairing. 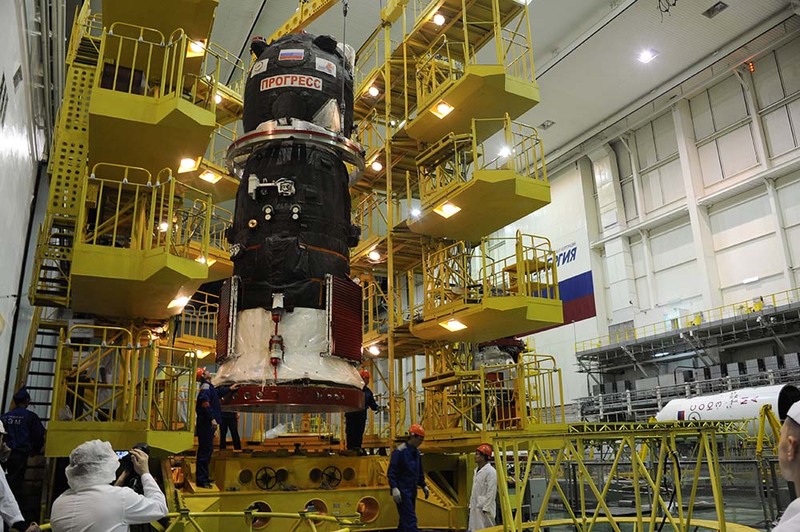 The encapsulated Progress spacecraft was transported to the Launcher Integration Facility where the Soyuz 2-1A rocket was waiting for its payload. The 27.8-meter long Core Stage already had its four 19.6-meter boosters installed over the past weeks and acceptance checks had been completed – leaving only the integration of the Upper Stage to be done. 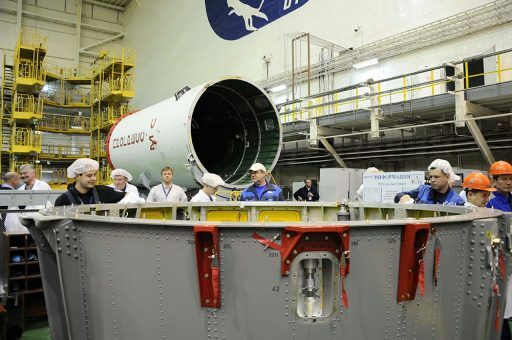 Once the upper composite consisting of the Progress inside its launch shroud arrived at the processing facility, teams installed it on the third stage of the Soyuz. Electrical and data lines from the spacecraft to the fairing, spacecraft and payload adapter were mated before the third stage was attached to the Core Stage in order to complete the integration procedure. The Soyuz 2-1A rocket has a launch mass of 308 metric tons standing 46 meters tall with a core diameter of 2.95 meters. 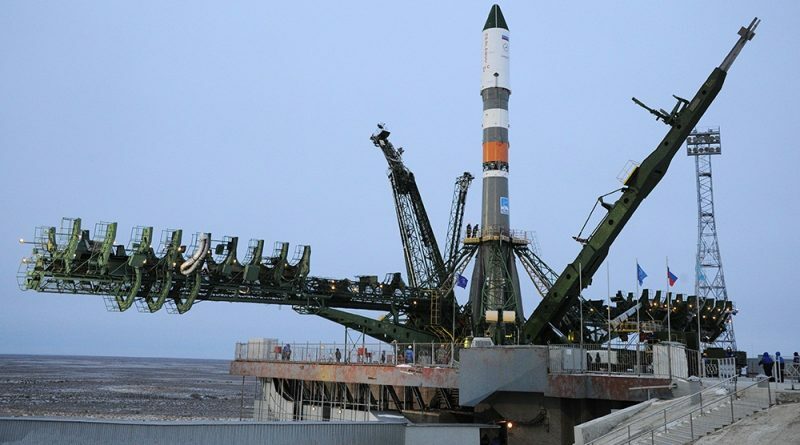 Per the old tradition, the rollout commenced on Saturday in the early pre-dawn hours at the Cosmodrome in a setting that has not changed since Yuri Gagarin’s historic flight in 1961. Riding atop rails under a star-filled sky, the Soyuz rocket slowly made its way to Site 31/6 of the Baikonur Cosmodrome. Once at the pad, the Soyuz was placed in its vertical launch position using the Transporter-Erector. 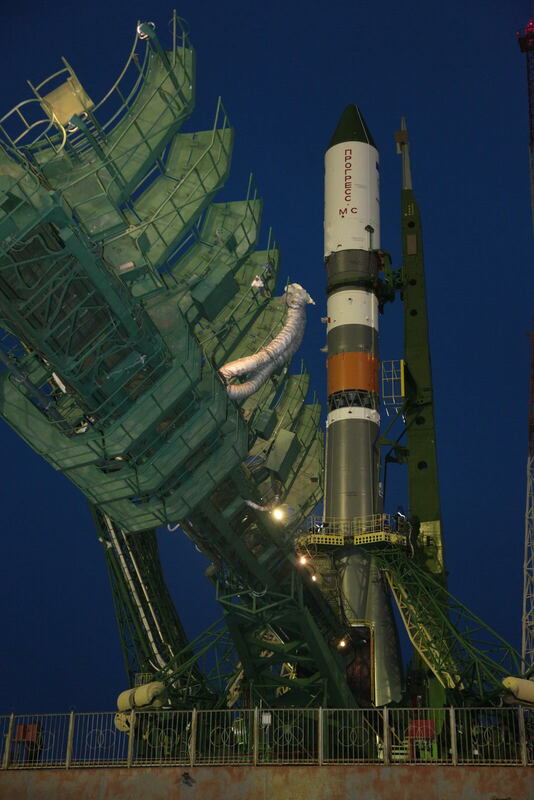 With Soyuz standing tall atop its pad, the two halves of the Service Structure were moved into position and so were the umbilical towers that interface with the boosters, the core stage and the third stage of the launch vehicle. As part of the nominal L-2 processing, the Soyuz is hooked up to propellant, pressurant and purge lines and electrical and data connections are also being made. 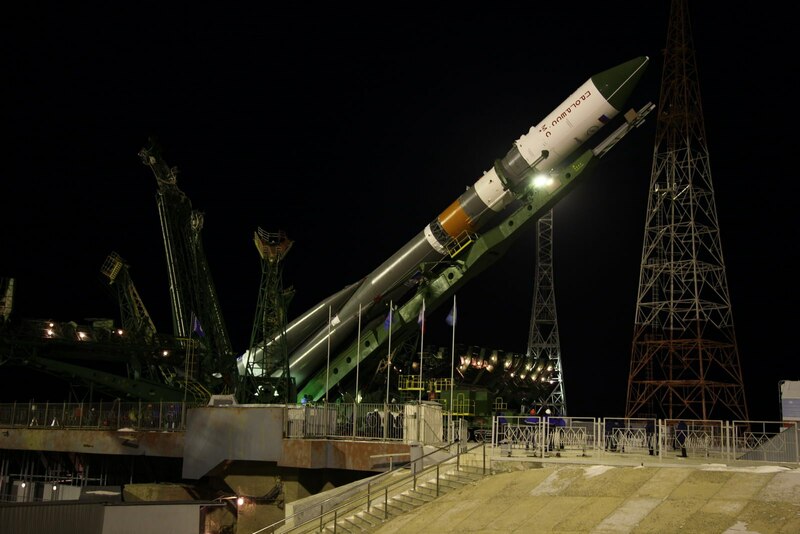 Countdown initiation occurs eight hours ahead of the planned launch time with the activation of the Soyuz launcher and Progress spacecraft for a last round of checkouts and reconfigurations. Communication checks, electrical testing and propulsion system testing is performed in the early stages of the countdown. Completing final hands-on work on the launch vehicle, engineers will install batteries in the booster and remove protective covers from the Soyuz including the first stage engine covers. Five hours before launch, the Russian State Commission convenes to review the status of launch preparations as well as the results of launch vehicle testing to provide the formal approval for propellant loading. 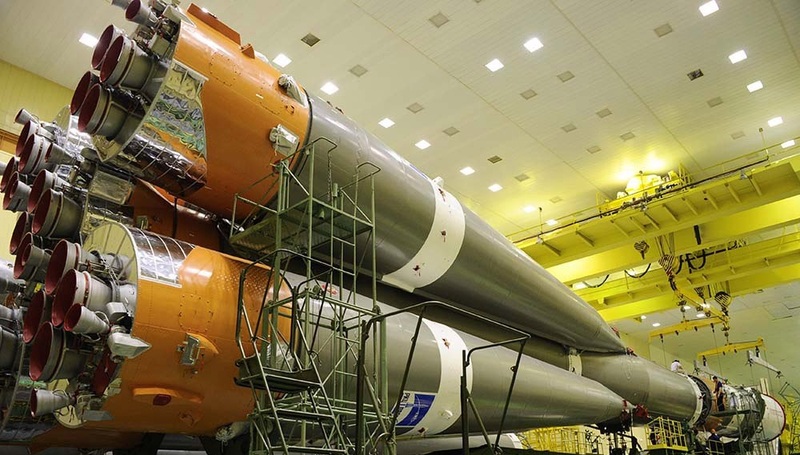 Five hours before launch, the Russian State Commission convenes to review the status of launch preparations as well as the results of launch vehicle testing to provide the formal approval for propellant loading. At that point, teams will be busy working on the Soyuz as final hands-on tasks and fueling preparations are being made. 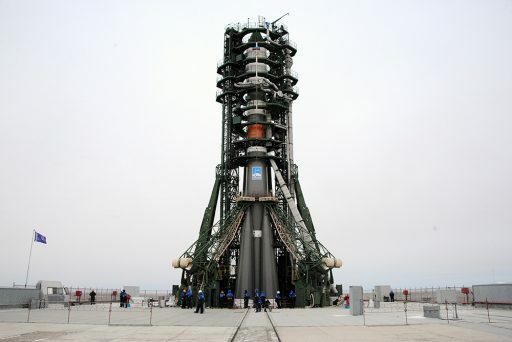 After the tanking cars pull up to the pad, they are connected to propellant systems to initiate the propellant loading procedure approximately four hours before liftoff. The 12 tanks of the Soyuz will be filled with a total of 272,140 Kilograms of rocket-grade Kerosene and –183°C Liquid Oxygen. In addition, the boosters and core stage are loaded with liquid Nitrogen for tank pressurization and Hydrogen Peroxide to drive the turbopumps of the engines. Fueling wraps up about two hours before launch, allowing teams to perform final close-outs of the launch vehicle and pad structures. During the final hour of the countdown, the Soyuz will go through a final set of tests and the Service Structure is retracted to clear the way for liftoff. The Guidance System of the rocket will be configured for launch and teams will evacuate the launch pad ahead of the Terminal Countdown Sequence. Heading into the terminal countdown sequence six minutes before liftoff, the Soyuz completes final reconfigurations including propellant tank pressurization, engine purge, and the transfer to onboard power and control. Twenty seconds before launch, the RD-107A and RD-108A engines on the boosters and Core Stage come to life and soar up to intermediate thrust levels before throttling up to a total liftoff thrust of 422,000 Kilograms. Liftoff is set for precisely 8:44:41 UTC as Soyuz rises from its pad to climb vertically before beginning to pitch and roll onto its precise ascent trajectory to begin heading to orbit. Roll capability is new for a Progress launch, provided by the digital guidance system of the Soyuz. The four liquid-fueled boosters will burn for 1 minute and 57.48 seconds, consuming 39,200 Kilograms of liquid oxygen and Rocket Propellant-1. Separation of the boosters is accomplished using pyrotechnics and pistons that send the four 19.6-meter long boosters into a tumble back to Earth for a crash landing 355 Kilometers downrange from Baikonur (7km further downrange than for Soyuz U). With the boosters gone, the core stage will continue firing its RD-108A engine, delivering 101 metric tons of thrust to continue powering the vehicle. The Core Stage will burn until T+4:36.89 when its engine will be shut down. Eleven seconds later, the third stage of the Soyuz ignites its engine and the pyrotechnic stage separation system is fired as part of the hot-staging sequence of the Soyuz. This will enable the third stage to pull away from the spent Core Stage and continue the journey into orbit while the 27.8-meter long core falls back to Earth for impact 1,550 Kilometers downrange (20km short of the Soyuz U impact Zone). Ten seconds after the RD-0110 engine of the third stage ignites, the Soyuz will jettison its payload fairing to expose the Progress for the rest of the way into orbit. The separation of the third stage’s aft section occurs 0.24 seconds after fairing separation to enable all items to impact in the same location, 1,576 Kilometers downrange from the launch site. In any previous Progress ascent mission, the fairing was dropped at T+2 minutes and 40 seconds, but Soyuz 2-1A will hold the fairing for another two minutes and 15 seconds. The reasoning behind this is to deliberately reduce the overall ascent performance by holding the extra weight of the fairing longer in order to keep the previous drop zones of boosters, core stage and third stage aft-section. 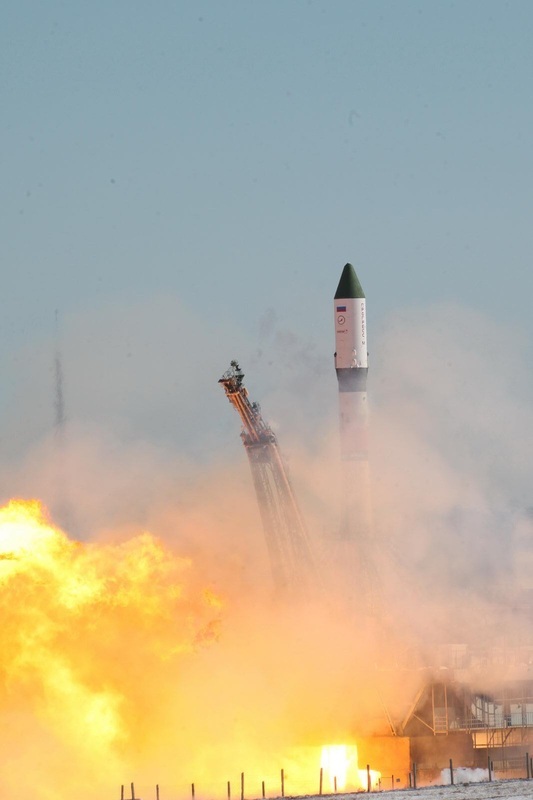 Drop-zones for vehicles launching from Baikonur have often been a source of conflict between Russia and Kazakhstan causing several launch delays while negotiations on a political level were underway to clear the way for new drop zones to be approved. By keeping the old drop zones, no hold-up to Progress missions can be expected while the overall performance of the launcher remains the same. The 298-Kilonewton RD-0110 engine of the Upper Stage performs a 3-minute 58-second engine burn. With the completion of the burn, the stack will be in orbit with spacecraft separation planned at T+8:48.17. Progress MS is targeting an insertion orbit of 193 (+/-2) by 238 (+/-5) Kilometers inclined 51.67 degrees. These orbital parameters reflect the increased insertion accuracy delivered by Soyuz 2-1A as the margins for both, perigee altitude and apogee have been reduced significantly. The Progress MS spacecraft is not using the expedited rendezvous profile to ISS in order to leave plenty of time for testing of the spacecraft before coming close to the Space Station. The standard two-day mission profile calls for a set of two orbit-raising maneuvers to be performed by Progress on its third orbit around Earth. These maneuvers are adjusted after launch based on the initial insertion obit of the craft to deliver Progress to an orbit over 300 Kilometers in altitude with a third burn on Saturday, on orbit #18. The Automated Rendezvous will be initiated early on Wednesday as Progress begins to use its KURS System to guide itself to the vicinity of ISS through a series of rendezvous burns, setting up for a flyaround and a completely automated docking to the Pirs module of ISS expected at 10:31 UTC.